NEW YORK, September 28, 2017 /3BL Media/ – JetBlue (NASDAQ: JBLU), the largest airline in Puerto Rico, today announced a multifaceted program to support both short-term relief and long-term recovery efforts on the island following the destruction from Hurricane Maria. 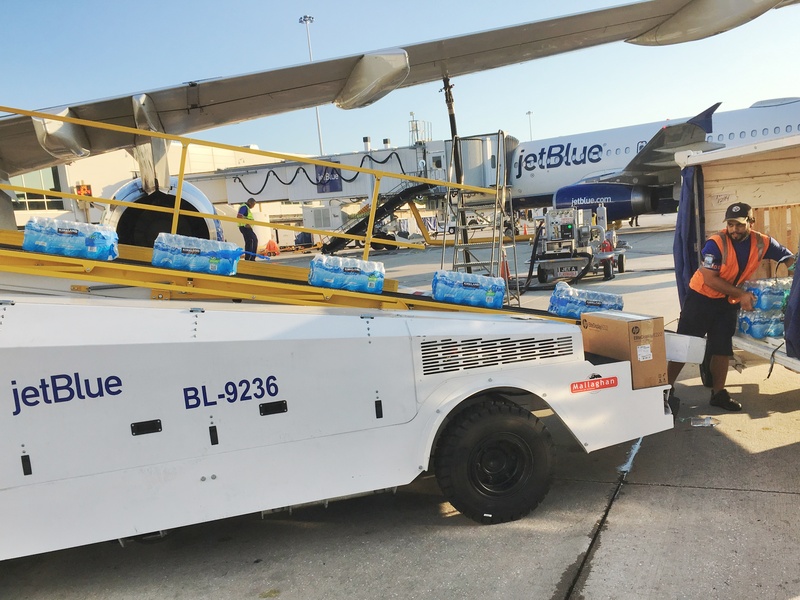 100x35JetBlue outlines the airline’s commitment to launching 35 initiatives over the next 100 days – and beyond – to support the needs of crewmembers, customers, and communities in Puerto Rico. Honoring the popular reference to Puerto Rico’s 100x35 mile size, the effort will roll out programs across the island to provide airlift support, relief pricing, awareness and fundraising, people deployment, unmet needs, and rebuilding efforts. JetBlue is currently operating six daily flights in Puerto Rico with more to come as infrastructure allows. 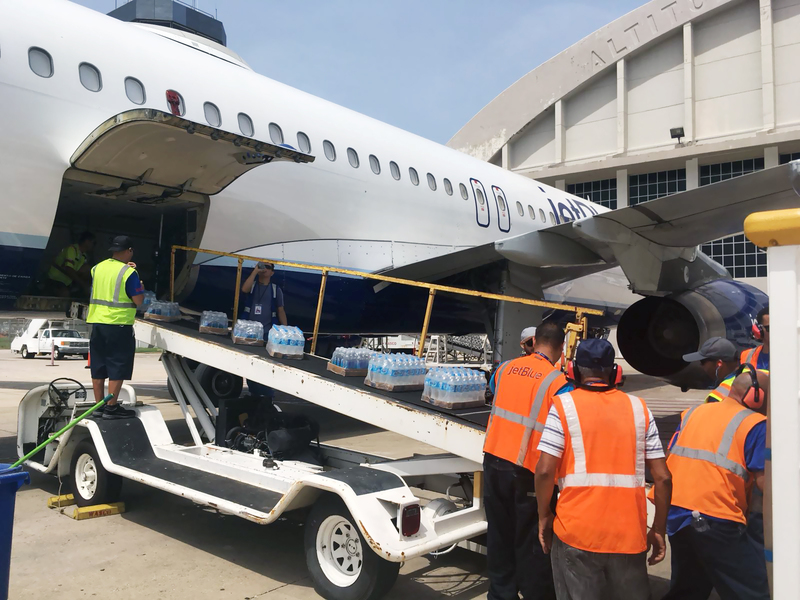 Since Hurricane Maria made landfall, JetBlue has continued to serve those in Puerto Rico by donating $1 million in supplies, airlifting more than 3,000 customers over 21 flights from San Juan and Aguadilla through Sept. 27, and transporting more than 100,000 pounds of supplies to the island. JetBlue’s support has also touched hurricane-impacted areas across the Caribbean, South Florida, and Texas. The airline will invite customers onboard every JetBlue flight to donate to JetBlue’s campaign at GlobalGiving benefitting hurricane impacted areas throughout the U.S. and Caribbean, with a $1 million goal. Customers can also contribute at GlobalGiving.org/jetblue. JetBlue has committed to match donations to its GlobalGiving campaign dollar-for-dollar up to $500,000 through Nov. 15. GlobalGiving will distribute the funds to non-profits making an impact in hurricane-affected areas. As we continue to serve these areas, we expect to adapt funding initiatives to ensure we’re meeting the needs as are communicated from partners on the ground. As the largest airline on the island, with nearly 500 crewmembers, service to three airports, and a focus city in San Juan, JetBlue is committed to working with government agencies, non-profit organizations and partners to support long-term rebuilding efforts. JetBlue is pledging to support replenishing vegetation across the island; providing support for children; partnering with community leaders to raise awareness; providing gifts and meals throughout the holiday season; and offering advertising space to promote tourism to Puerto Rico. JetBlue is New York’s Hometown Airline™ and a leading carrier in Boston, Fort Lauderdale-Hollywood, Los Angeles (Long Beach), Orlando, and San Juan. JetBlue carries more than 38 million customers a year to 101 cities in the U.S., Caribbean, and Latin America, with an average of 1,000 daily flights. For more information, please visit jetblue.com. (a) Blue Fares to and from any JetBlue U.S. city, to Aguadilla, Ponce and San Juan, Puerto Rico are capped at $135 per person, one-way from 9/19/17 until 11/15/17. Blue Fares to and from San Juan, Puerto Rico to Punta Cana, Santiago, and Santo Domingo, Dominican Republic as well as St. Thomas and St. Croix, U.S. Virgin Islands are capped at $129 per person, one-way from 9/19/17 until 11/15/17. Blue fares only. Fares include government taxes and fees and must be purchased and used by 11/15/17 (the earlier of 11:59 PM ET or local). All fares are subject to limited availability; may not be available on all days or all flights; may change without notice; must be purchased at time of reservation; and are one-way, nonstop (except as otherwise noted), nonrefundable, and nontransferable. View details on government taxes and fees. Proper documentation required for boarding. Checked Baggage Allowance/Fees: For Blue fares, first and second checked is included. No additional bags or bags weighing over fifty (50) pounds will be accepted. Weight and size limits apply. View baggage fees and other optional services and fees. Change/Cancellation Fees: All reservations made one week or more prior to a flight's departure may be cancelled without penalty up to 24 hours after the reservation is made. Changes and cancellations made 60 days or more prior to departure date: $75 per person fee plus difference in fare. Changes and cancellations made less than 60 days from departure date: fares under $100, $75 per person plus difference in fare; fares between $100 and $149.99, $100 per person plus difference in fare; and fares of $150 or more, $150 per person plus difference in fare. View Change/Cancel fees information. Additional Change/Cancellation Terms (all fares): For changes, there may be a fare adjustment. Cancellations receive JetBlue travel credit, valid for one year. Changes/cancellations must be made prior to scheduled departure (otherwise all money for fare is forfeited). Flight terms and conditions apply. (b) Each flight will allow up to eight (8) pets to travel. The $100 fee for each pet, each way is waived until 11/15/17. Each customer may travel with one (1) pet per flight for $0. Subject to JetPaws terms and conditions. (c) Customers who purchased Puerto Rico flights by Sept. 17 can rebook online in the Manage your flight section of jetblue.com or Contact Us prior to the departure time of their originally scheduled flight. New flights must be rebooked by Wednesday, November 1, 2017, and travel must be completed by Wednesday, November 15, 2017. Original travel must have been booked on or before Monday, September 17, 2017.